When was the last time you checked your electrics? With the majority of accidents in the home caused by faulty electrics it is important you check your wires on a regular basis. With our electrical wiring in Bournemouth, Merrivale Electrical will inspect and fix any faulty wires you may have on your property. How often should I check my electrical wiring in Bournemouth? It is important that you check your electrics every ten years. Over time, as your wires go through general wear and tear, your electrics will deteriorate. If there are any fractures in your electrical wiring in Bournemouth, then it will have damaging effects on your electrics. Without fixing these wires, you will be putting your family or employees at risk by making your property extremely susceptible to any fires and electric shocks. How do I know when I have an electrical fault? Is there a problem with your electrics? When there is damaged wiring on your property, there are a few signs you may notice. Sparking plugs, flickering lights and burning odours are just some of the first indications that you will recognise when there is a fault in your electrics. Our electrical wiring in Bournemouth will ensure that this never happens on your property. 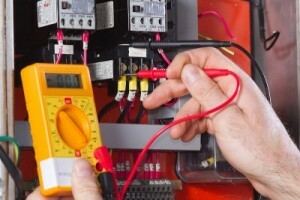 We will send one of our team to check and inspect your fuse box and any visible wiring that may be causing the problem. Our checks are under the periodic inspection reporting and will reveal any overloaded circuits, any potential shock risks, and any lack of earthing and bonding. When our electricians carry out a survey on your property, we are complying with the standard building regulations of the industry that the states any person carry out electrician work are fully regulated. At Merrivale Electrics, having a registration with the NICEIC means we are proud to be a part of an approved Contractor Inspection Reporting Scheme. You will be rest assured, because of this, that all your electrical services are carried out with the absolute care. Read more about our wiring services at Merrivale Electrical and make sure your property is completely safe and secure. When you choose Merrivale Electrical to carry out your electrical wiring in Bournemouth, you will be investing in the best electricians in the South West. We comply with every aspect of part P of the Building Regulations so that we deliver superb results in every project we undertake. If you wish to get in touch with us, don’t hesitate to call Merrivale Electrical today on 01202 389197.